Could be a great jersey to strip and renumber as a #18 Mauck or #3 Faulk. This is one of the older LSU jerseys that you will have an opportunity to buy/find anywhere. 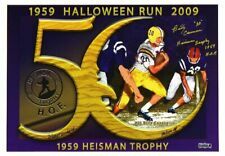 An LSU Tigers 14x20 NCAA Halloween Run Photo hand signed by Billy Cannon. The item and signature are in excellent condition. The item is limited edition of 100. You will receive a random number from the collection. This style of jersey was only worn in 2012, Josh Downs wore #77 in 2012. Round SEC Patch on the collar. Richard Murphy wore this number both of these years. Nice piece of LSU History. Worn in either 2009 or 2011. Nice piece of LSU History. Based on the specific style of this jersey, it would have been worn in 2009 or 2011. JC Copeland wore #44 for the Tigers in 2011, and Danny Mccray wore it in 2009. Worn in either 2009, or 2011. Worn in either 2006, or 2008. (2007 had the 75th SEC Patch that is not present). LSU Tigers Nike Game Worn PURPLE Jersey #99 2006/08 - Marlon Favorite "Big Fav"
Worn in either 2006, or 2008. (2007 had the 75th SEC Patch that is not present), Marlon wore #99 for the Tigers both years this jersey style was worn. #46 Size 44 Tashawn Bower's #. Tashawn Bower played for the Tigers, wearing #46 for them from 2013 through the 2016 Season, and now plays for the Vikings. Based on the font of the shoulder numbers ( a single season font style), it was likely used during the 2013 season by Frank Herron. Perry Riley was drafted in the 4th Round of the 2010 NFL Draft by the Redskins, Riley played for the Redskins from 2010 to 2015, and played for the Raiders in 2016. Riley's LSU Bio Worn in either 2006, or 2008. And in 2011, Dennis Johnson wore #97 for the Tigers, Johnson is now the current Defensive Line coach for the LSU Tigers. This style of jersey, with the SEC Flag Patch, and "LSU" embroidered above the numbers. Richard Dickson's LSU BIO. Richard Dickson wore #82 during the 2006 and 2007 seasons. Dickson would then be selected to wear the prestigious #18 for the 2008 and 2009 seasons. he wasthe most prolific Tight-End in the History of LSU Football. Charles Alexander wore this number both of these years. Worn in either 2006, or 2008. (2007 had the 75th SEC Patch that is not present). SOPHOMORE SEASON (2006). Pocic currently plays in the NFL for the Seahawks. I do not know the exact player, or season it was used. But based on the font of the shoulder numbers ( a single season font style), it was likely used during the 2013 season. Billy Cannon Signed LSU Tigers Iconic 8x10 Photo with "Heisman Trophy"
An LSU Tigers iconic 8x10 photo hand signed by Billy Cannon. The item and signature are in excellent condition. Radtke Sports uses professional lighting for our product images that may show reflections. Johnson signed as an undrafted free agent in 2014, and currently plays for the Colts. Based on the shoulder font, I believe this jersey was worn in 2013 by Anthony Johnson. DON'T LET THE SIZE FOOL YOU I WEAR A SIZE 38 WAIST AND THE FIT JUST FINE. THESE SRE IN EXCELLENT SHAPE AND A MUST TO COMPLETE YOUR LSU OUTFIT.….TIGERS ARE ROLLING. LAST PAIR I HAVE.…. LSU Tigers Nike Game Worn Jersey #99 2006/08 - Marlon Favorite "Big Fav"
The item and signatures are in excellent condition. Don't miss out on this one of a kind item signed by LSU Greats! Radtke Sports uses professional lighting for our product images that may show reflections. Ball has a "02 13" date code indicating it was used during the 2013 Season . Just imagine the Tiger greats that could have held this ball or the amazing plays it was used in. This piece would look incredible in any sports room, den, office or man cave. Ball has a "01 15" date code indicating it was used during the 2015 Season . Just image the Tiger greats that could have held this ball or the amazing plays it was used in. This piece would look incredible in any sports room, den, office or man cave. We have sizes 52, 50, 48, and 46.